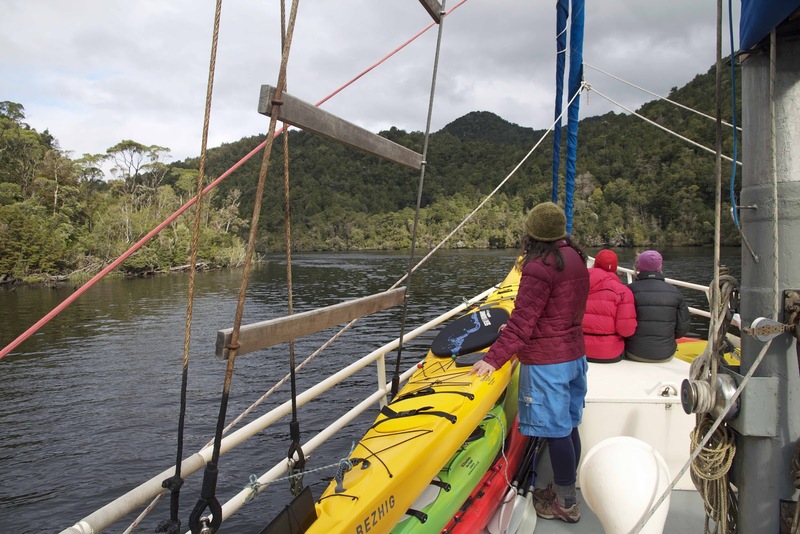 First there’s the long drive to Strahan, then the equally long ride across Macquarie Harbour aboard “Stormbreaker”; the one a lurching test for the stomach, the other a slow, rocking transition to the wild. For a time the ketch’s skipper is even able to hoist sail and cut the engine. It could be any time in the last few centuries. In fact it’s 2012: and the end of a long and full year. I’ve worked right up till the night before this ten day sea kayaking trip on the Gordon River. But as “Stormbreaker” drops us at our remote campsite and chugs off up river, the year suddenly slows to a stop. An enveloping, welcoming silence falls. We put up tents and tarps, chatter a little, arrange a communal area for the five of us, and generally settle in. Then we notice how occupied the silence is. 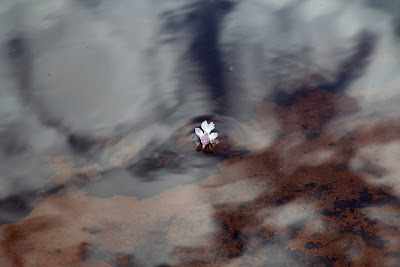 Wavelets are licking at the shoreline, the wind is shushing through the foliage, birds are jikking, chipping, caroling and chattering, bees and march flies buzzing and humming. This is no silence: it is a chaotic symphony, at once serene and frenetic. I try to get my ear and eye in by identifying birds and plants. It’s one way to manage the massive transition from busyness to wild pause. We’ve chosen to be away from the usual Christmas rush. 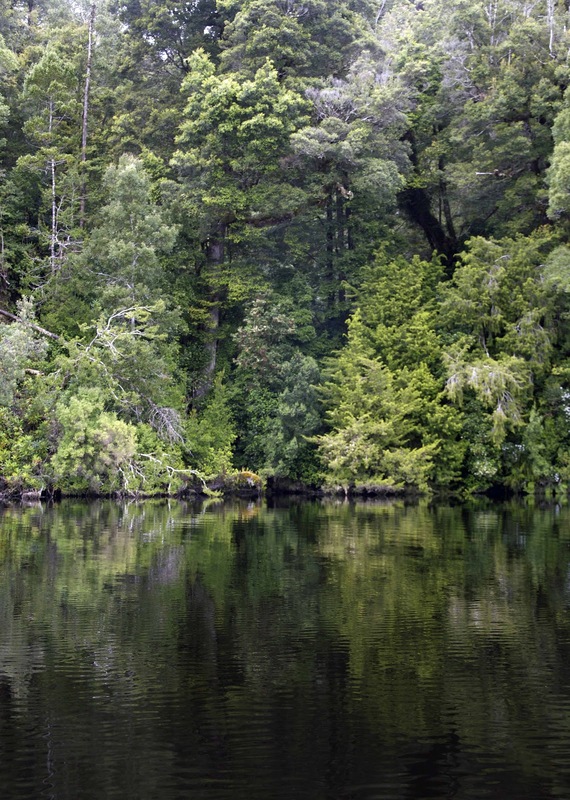 We will celebrate Christmas on the Franklin River, if all goes to plan. It’s made me feel disconnected from the swelling streets and shops of Hobart; the trickle of Christmas cards; the torrent of Christmas marketing. As much as I love Christmas, this year will be different. But our paddling time soon reminds us we’re on a wild river. 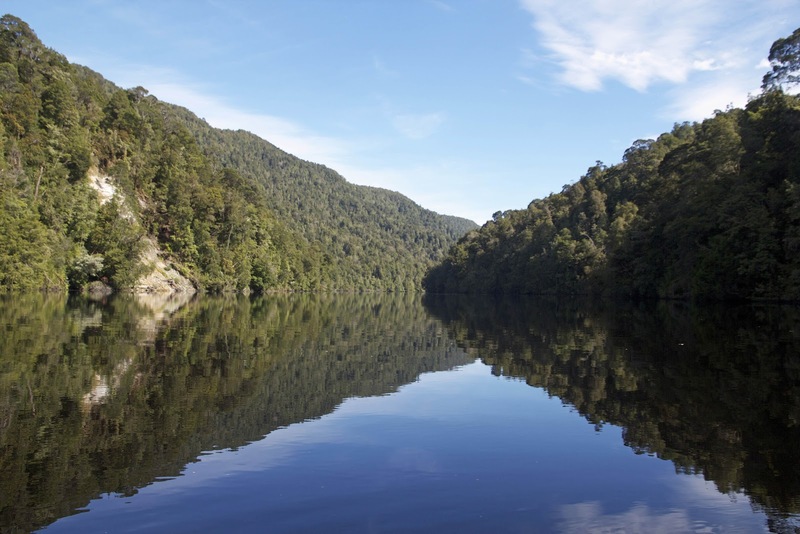 We see no other soul, just wide, calm, coffee-coloured water, unfathomably deep; fringed by high banks and hills decked in wildly luxuriant vegetation. Huon pine, tea-tree, paperbark, native laurel, horizontal and myrtle all grow wildly and well in this water-soaked place. A different Christmas or not, one plant above all is determined to put up its decorations. 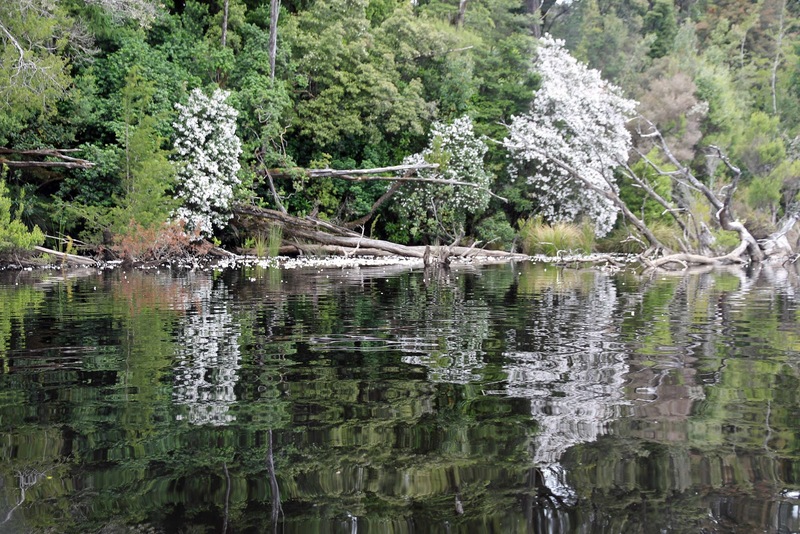 Tasmanian Christmas bush, aka mountain lilac (Prostanthera lasianthos), is fully in bloom all along the river banks. A tree that is otherwise inconspicuous can put on a spectacular display at this time of the year. Its deeply lobed flowers are a range of whites, if such a thing can be imagined. Some trees have flowers with a pinkish tinge, others a pale mauve tint, some the purist, luminous white. But all flowers here have purple throats. 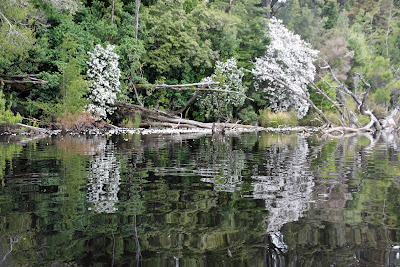 Large sprays of flowers on the trees are mirrored in the calm waters, strongly contrasted with the trees’ dark green foliage. 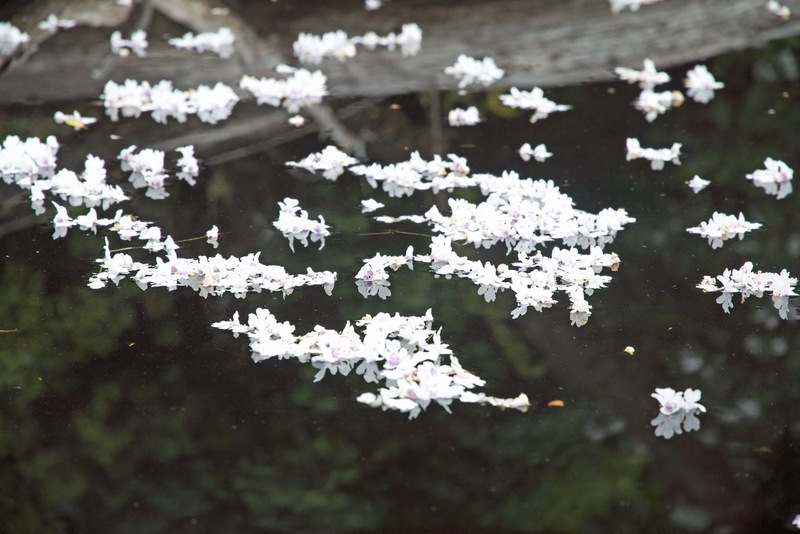 At times winds cause masses of flowers to fall into the river. At first we see just the odd flower floating, four of its lobes catching the wind like a miniature Spanish galleon. Before long we see a flotilla, and then what looks like a whole armada setting sail across the mighty Gordon. If they conquer nothing else, they win our hearts, distracting us from the rhythmic work of paddling, bringing us a wonderfully wild Christmas gift. What’s That You See, Skip?